The 2014 Infiniti QX80 has your back--actually, its own back. Rear sensors on this luxury SUV can detect objects behind it and apply the brakes if you don't. It's another step in the evolution of hyper-alert car tech that tries to sense dangers that a fallible--or momentarily distracted--driver might miss. 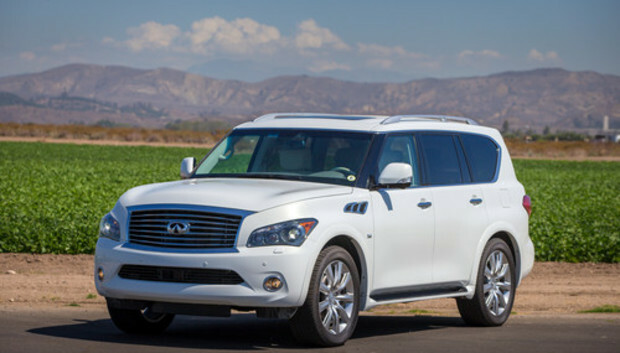 Introduced in the 2013 Infiniti JX, the backup intervention tech makes perfect sense for the yacht-sized QX80 (base price: $61,350). Just backing out of your driveway, you could run into a lot of carelessly placed small outdoor objects, like garden equipment, not to mention pets and kids--all too short to be seen out the QX80's high back window. To try the system, we started with the obvious: a tall trash can. The QX80 spotted the five-foot object with no problem and stopped the car. The QX80 also had no problems detecting a four-foot stroller. For smaller objects, we had to adjust the sensor a bit. Under the Settings menu on the touchscreen, you can bump the sensitivity from its default middle to a higher or lower setting. With a two-foot bag of leaves (also about the size of a child sitting in the driveway), the QX80 rolled over it every time with the sensor on the middle setting. On high, the car stopped each time readily. To detect objects like a small kid's chair, we also had to bump the sensitivity to high. A ladder is the one object that flummoxed the system. The QX80 did not stop for it at any setting. At night, the sensors spotted a trash can with the sensor on high, but there was a bit more of a delay. In a few cases at night, the QX80 tapped the trash can slightly. One surprise: when the QX80 stops, it does not hold the stop. While the jolt you feel when the car brakes should make you step on the brake yourself, we expected that the QX80 would hold until the driver acknowledged the alert. Infiniti has made it very clear that the intervention tech should not replace vigilance when driving. A Mercedes S550 can spot a deer jumping out at you on the highway. A Ford Focus can parallel-park itself. An Acura RLX can keep you centered in the lane by controlling the steering wheel. And now, the Infiniti QX80 can stop before you hit something behind you. We hope the technology makes its way into every car--not just this SUV behemoth.